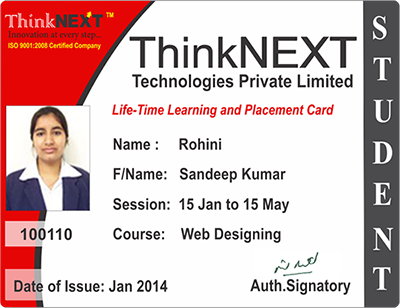 ThinkNEXT offers Life-Time Validity Learning and Placement Card to each student undergoing 6 Months Industrial Training. The benefit of this card is that the student does not need to pay again and again for the same course. Students have to pay only once for any course and they can take classes for the life-time period whenever they need it by showing this card. This card also enables each student for Life-Time support for ThinkNEXT Placement Services. © Copyright ThinkNEXT Technologies Pvt. Ltd.